The other thing that occupied my time toward the end of November was the arrival of 4 feet. I saw "her" (I think it's a her. I haven't been able to reliably check, but it's just easier if we call it "her".) when I came home one weekend afternoon. She was just sitting on the deck. It wasn't overly cold, yet. She ran when I came close to the deck, jumped off, but didn't go very far. She just sat a good 6 feet away from the deck, watching me. I had a cereal box I was going to recycle so I took it apart and poured a half cup of food on it. I set it near the back door, backed away and just watched. It was like she hadn't eaten in a few days. She ate every last piece of food. So, I opened up the door and added another scoop, which is a quarter cup, to the box. She snarfed that down too. I watched as she left and she went under my deck. How long she'd been there is anyone's guess, but I felt, immediately, a need to care for her. The next day, I pulled out the Kentucky Fried Chicken containers they have for sides and put food in one and water in the other. It was getting cold. We were about to get the first close to zero days of winter, along with snow. I worried. I fretted. I hit up YouTube and posted this photo to my Facebook feed. 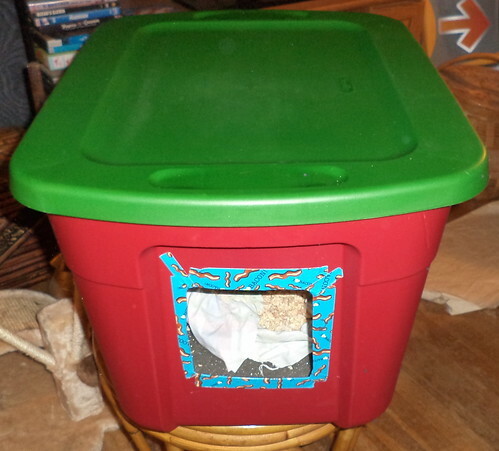 Friends sent links on how to made a cat house. I watched and read everything, but couldn't get to Target for another week. Still, I put out food every morning when leaving for work and although the water was frozen when I got home, the food was gone. Finally, I made it to Target to get a plastic bin. The one I really wanted didn't have a lid. I asked if they had extra lids in back and the gal went to look, but never returned. 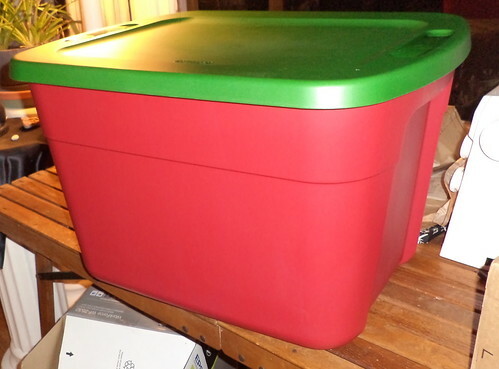 When plastic bins aren't "en vogue", like in January, it's really hard to find reasonably priced totes that have lids. But, if I remember my science, darker colors absorb heat so perhaps this is better than the lighter colored one that was a bit bigger. 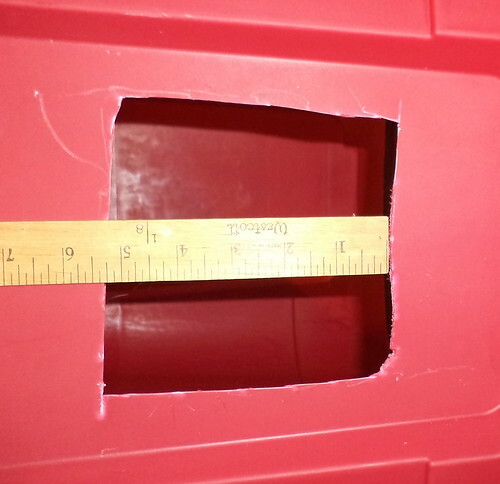 Step 1 is to measure up from the bottom of the tote, 5 inches and then cut a 5 1/2 inch square. I have a simple hand saw that I've had for years. 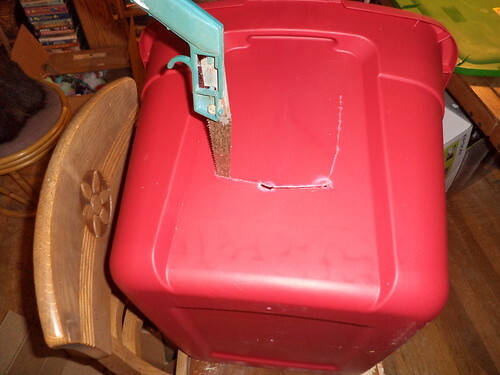 I wound up bending the blade as I cut through the plastic. 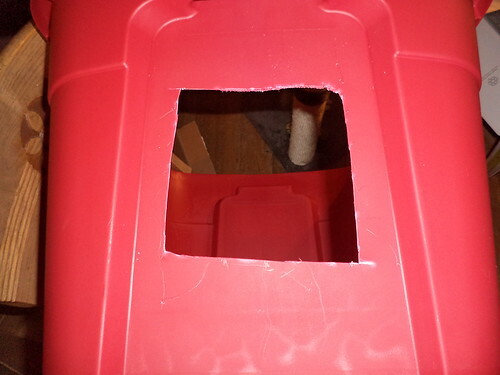 In the end, I got out my Cutco kitchen scissors and used them to cut the hole. They cut through just about anything and don't dull. There was a quick check of the opening size and it was good to go. Some instructions didn't cover the opening edges. They just left them raw. While not sharp sharp, they would be uncomfortable if the cat were to brush up against them. So I took some duct tape sent to me by my friend, Meredith, and covered the raw edges. Yes, that is bacon decorated. Now for the inside. All the videos and written descriptions called for straw to be used as an insulation material in conjunction with styrofoam. Well, at work, we get this 2 inch thick foam packing material. This stuff is really good for insulating our equipment and for shipping things. We tend to get it in abundance and will, twice a year, send back to our shop, a couple boxes of it. Over the years, I've grabbed some excess when I've wanted to ship things so I have a grocery bag full. I put two pieces in the bottom, although one was a bit shorter than the other. I took two large rectangles and had to cut off about 3 inches to make them fit in the box. I wound up doing a bit more cutting to get enough pieces to line the inside of the container except for that small spot in the corner. But this is big enough that a couple of cats her size would fit comfortably. 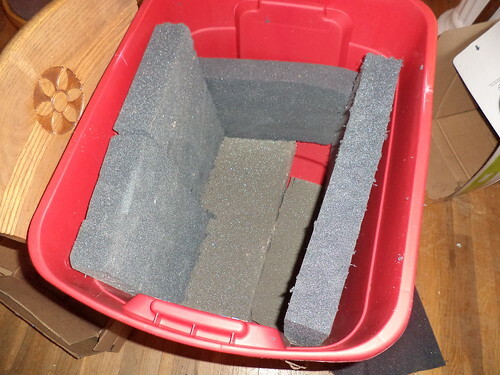 This is where you would add straw on either side of the foam to act as insulation. 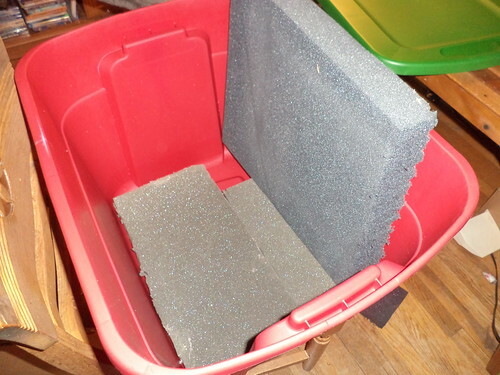 I felt that width of the foam would help keep the cat warm. The next step is to cover the bottom with straw. Target didn't have straw and I couldn't think, off the top of my head, where I could get straw. I have, however, dozens of small fabric squares which I've saved to use as rags. Those of you who toss clothing that's worn out do not know the value in rags. They are so very useful for a variety of things. 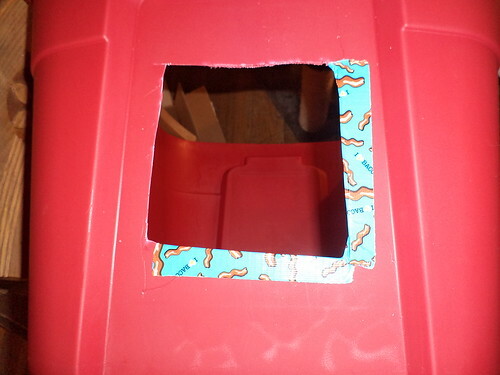 I took an old sheet, cut it into hunks and put a large hunk in the bottom, covering the hole. After the container was finished, friends said I should have gone to JoAnn Fabrics because straw would be available for Christmas displays. I never thought of that. 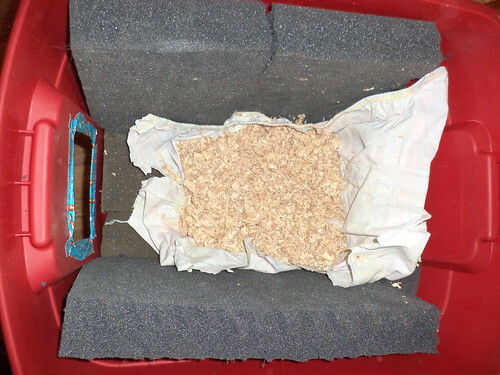 I used pine bedding which is for hamsters and gerbils. 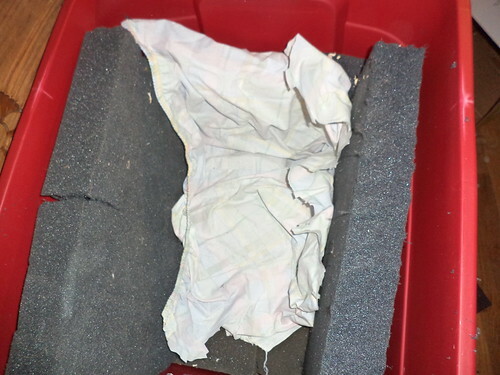 I put about a quarter of a pound in the back of the container on top of the sheet. The bedding will absorb water from wet fur and, being on top of the sheet, I can easily pick the whole thing up and change it out. Here is the finished container. Pleased with myself, I stuck this on the deck and waited for any evidence it was being used. I also got a dish with compartments for food and water. We entered a very cold and snowy period right before Thanksgiving. I didn't see the cat, although I did see footprints in the snow and the food was being eaten. Then, the week before Thanksgiving, I opened the door to put the food out and she shot out of the container to dash under the deck. I was so thrilled. I set down the food and closed the door. 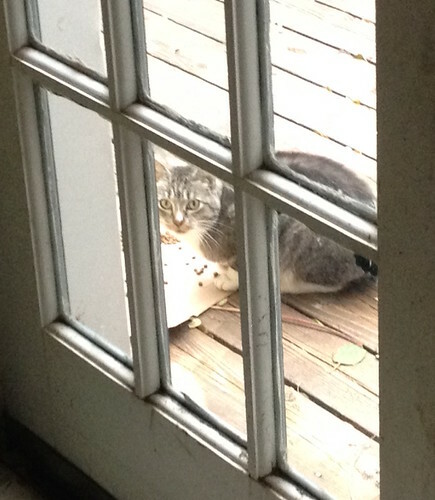 When I opened it again, she was there eating, but took off under the deck. I started the car and she had come back up onto the deck to finish off her breakfast. Over the next week, we got into kind of a rhythm. I would feed her on my way to work and pick up the dish when I got home. She seemed to get used to my patterns. Cats are notorious for preferring a sameness to a schedule. There she is, waiting for me to bring out her food and water. On a couple of occasions, she came up to the back door and looked in, meowing at me. "Yeah yeah yeah. I'm coming." 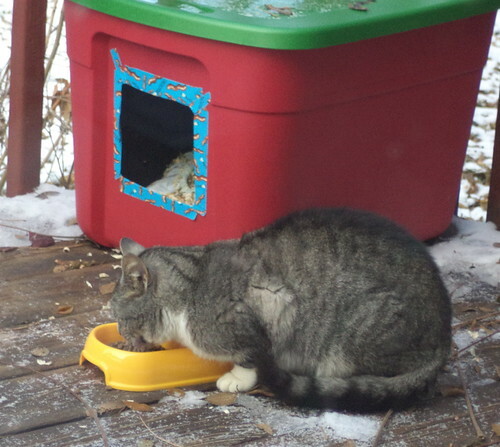 When we got the first snow of the year, I swept off the deck to make eating better and less cold on paws. If the weather says we're to have precipitation, I take one of those Kentucky Fried Chicken containers and stick it just inside the doorway. 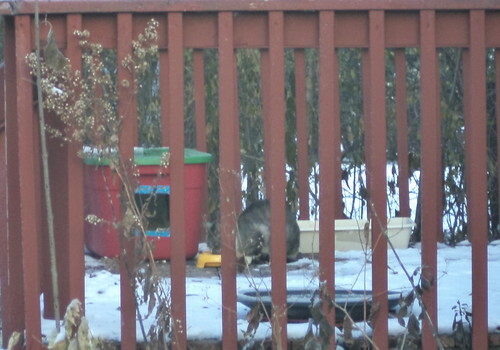 I don't know if she goes inside then to eat or if she eats with her head inside but the rest outside. The girls have noticed her. Mija saw her first and there was some growling. My back door is a full window so they can look out onto the deck. Mija left the back door and, although she's gone back to the door, hasn't seen her. Pilchard, on the other hand... Last Thursday, she came up to the door and Pilchard, whom, you have to admit, blends in perfectly with the night at 2:30 a.m., was sitting there, watching. I was awakened by the usual growling, hissing, spitting of a very angry cat. My initial reaction was that the girls were having an argument, but the noise was in the kitchen. I dashed to the back and saw the cat sitting on the top step of the deck. She saw me and, as I tried to calm Pilchard down, slunk down the stairs. She did not eat on Friday. I saw her on Saturday. 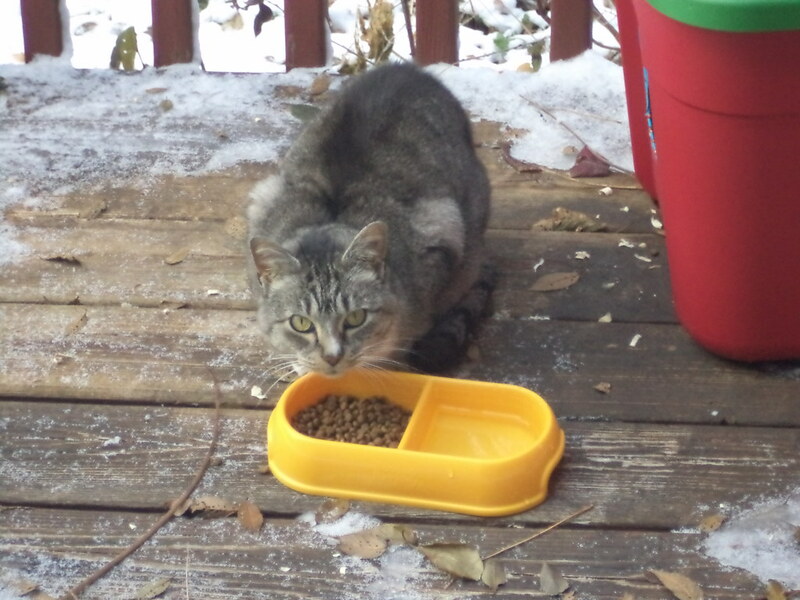 She came and ate and then left the deck to go toward my neighbor's back yard. I have not seen her since, but the food is gone when I come home from work. I called Tree House Animal Clinic in Chicago. They are an absolutely wonderful no-kill shelter in Chicago who advocate for "community" or feral cats, in addition to being a full service veterinary clinic. It's possible the presence of an angry cat on the other side of the door scared her from using the shelter. It's also possible that because we have had milder weather, the cat has other options. My keeping food out every day and the fact that the food is gone means the cat is still coming by to eat. She may, eventually come back to the shelter. Some cats just won't use them. 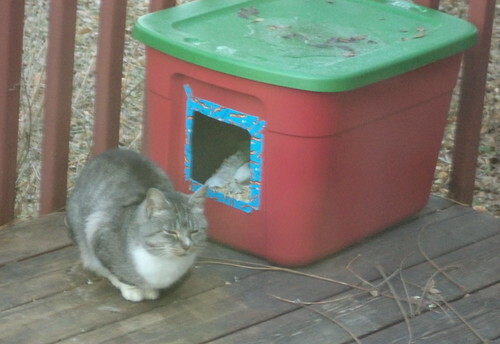 The gal to whom I talked said she has 3 boxes in her back yard and none of them are used by any of the feral cats she cares for. HRH sits by the back door and watches now. I would hope this is not a deterrence to using the shelter. I would feel horrible if the cat is living under someone's deck because of Pilchard. The other question I had was how to keep the entrance clear of snow. We had the 3rd snowiest winter on record at the beginning of this year and some of those snows would cover the entry. She said some people have a table they put over the entry to keep it snow free. I could use the plastic table I have for the deck. If I got a hunk of wood, I could put that between the table and the tote and the west wall of the deck. That would further keep the snow from accumulating or blowing into the house. Plus, it would give me some time to get the area clear of snow since I always shovel off the deck and to the Jeep first anyway. My goal is to get her to trust me somewhat so I can take her to a vet for a check up. The gal at Tree House said they have traps to rent and they have experience handling strays. Her ear is not tipped which is what community cats who have been spayed and neutered and returned to the wild have. It's important that she be up-to-date on shots and that she be spayed. I suspect, because she didn't run from me, but went under my deck, that she used to be someone's cat who was shoved outside. I want to make sure she's not microchipped and just lost. So, that's what I've been doing with my time. I thought about shoeing her away, but I realized it would bother me, greatly. I can't not do something. Cats are highly resilient creatures, but providing the best I can means she'll have a better life. I need to add more bedding this weekend to plump things up. I don't know that even if I could win her trust that she could come inside with me. I think the problems I have with the girls getting mad at one another would be magnified, but I'm doing the best I can. I'm going to call her "Rosalind", after my favorite female Shakespearean character, at least until I know a different gender.